But, why was I excited? Because the movie is about my people and my events; characters and times I’ve studied and lived with for over twenty years; characters and events featured in my book Selene of Alexandria. Normally, I’ll go to a historical movie with some relish, but this time it was with eager anticipation and some trepidation. Would the writers/director get it right—the setting, the politics, my beloved characters? And here’s the answer: big picture yes, details no. For the record, this is not a movie review. I’ll leave the assessment of Agora’s worth as a piece of art to others. For those who haven’t seen the movie, there are spoilers. But if you know the story of Hypatia, you basically know the movie plot. What I talk about is the history behind the movie-what the writers/director got right and what (in my opinion) they got wrong. Every year, nay every moon, we make new creeds to describe invisible mysteries. We repent of what we have done, we defend those who repent, we anathematize those whom we defended. We condemn either the doctrine of others in ourselves, or our own in that of others; and reciprocally tearing one another to pieces, we have been the cause of each other’s ruin. In the big picture, Amenábar got this right. We see Hypatia challenging her students to explain an astronomical anomaly, exhorting them to be “brothers” in spite of their religious differences, and rebuffing an amorous student by giving him a handkerchief stained with her menstrual blood. Although little of what Hypatia worked on survived, we do know she was an avid astronomer and built instruments like the astrolabe. I was delighted that the movie presented Aristarchus‘ (3rd Century BC) heliocentric model of the earth revolving around the sun (not to be revived in the West until Copernicus.) But using it as a theme for Hypatia to study and try to prove is most likely bogus. As to her students, they came from prominent families from all over the Empire to study with her. She had both Christian and non-Christian students and many went on to occupy high positions in both the Church and government. We know the names of some of her most intimate circle from the letters of Synesius of Cyrene who later became Bishop of Ptolemais. Hypatia espoused the philosophy of Neo-Platonism that taught that in man’s search for god; he must live in harmony with himself and give up the distractions of the world—similar to the teachings of the aesthetic Christians. In order for her students to attain “union with the divine” they must study, meditate, and live ethical lives. Beauty is a result of inner perfection, not physical beauty. Which leads us to the story of the bloody handkerchief—another of my favorite Hypatia stories. Amenábar has one of Hypatia’s students Orestes (Oscar Isaac) fall in love with her. He corners her in the library to press his suit, where she suggests that he choose another muse—music. He then declares his love for her and praises her beauty in a public theater where he plays an original musical piece and presents his pipes to Hypatia. During their next class, Hypatia hands Orestes a “present” in return—a handkerchief stained with her menstrual blood—and asks, “Is there any beauty in that?” Humiliated, Orestes storms out. I’ll continue my “reel” vs. “real” analysis in Part II where I’ll look at the destruction of the Serapeum, the expulsion of the Jews from Alexandria, and Hypatia’s murder and in Part III where I look at the major characters. I’m also frustrated at the slow release in the US. Newmarket Films bought the distribution rights and hasn’t posted anything on their site other than the New York and LA releases. It’s also been playing some festivals. The religious reaction may have scared them off, but I hope not. Maybe they’re just building up buzz on the coasts before bringing it out in the heartland. If I run across anything else, I’ll send you note. Thanks for dropping by! Thanks so much for mentioning this movie! I love historical flicks and novels and look forward to reading yours and seeing the movie now. ;D Thanks for the link to my blog, btw. I’ll be sure to reciprocate. You’ve got a very nice site here. Thanks, Victoria. Glad you had such a great time at your retreat. Good luck with your book! I’m eyeing an Agora R2 DVD from Spain from Ebay. I’d suggest you buy it from foreign Ebay markets instead of waiting for it. There are frequent riots throughout the 4th C as one Christian group persecutes another. Rioting was the favorite municipal sport in old Alexandria. This was noted by Ammianus Marcellinus, the Historia Augusta, Socrates Scholasticus, and others. The “holy virgins” of Heliopolis were stripped and exposed by pagans, their bellies cut open and swine fodder mixed with their entrails. Then pigs were let loose on them. When Theophilus dug up an old Giant Phallus of Priapus and sundry other gods during the renovation of an old Arian church (built on the ruins of a derelict pagan fane) the pagans rioted, there were street battles, and the pagans took refuge in the fortress-like Serapeum, where they tortured and killed their hostages. This is what led the Augustus of the East to order the temple dismantled. No dead baby skulls, no fighting over dead baby skulls. When Orestes announced regulations on the dancing exhibitions, Hierax cheered too loudly and the Jews said it was to raise sedition, so Orestes had Heirax tortured. When Cyril chastized the Jewish leaders over this, they organized a mob, cried that night that the local church was on fire, then attacked and killed the Christians who came running out to put out the fire. This led to a Christian mob the next day seizing the synagogues and driving the Jews out of town. When Cyrus and Orestes started bickering over who had a bigger one, a mob of Nitrian monks came to town and assaulted the prefect. Another mob of Christians rescued him from the monks. The prefect then had one of the monks tortured to death. When the rumor went around that Hypatia was preventing Orestes from reconciling with Cyrus, a mob of orthodox Christians led by Peter the Lector did to her what an earlier mob did to George the Arian. The difference was that even the Arians disliked George while Hypatia was universally admired. Later, the orthodox bishop Proterius was assassinated by Monophysites, who then did to him what was done to Hypatia and to George. Dismember, drag, burn, and scatter. Alexandria. You gotta love the town. Hi Jared. I’d love it if you read my book! ; ) However, I didn’t find any unsupported claims in your review. You were talking more about the science than the history, something, I’ve only studied tangentially. Unfortunately almost all of Hypatia’s writings are lost, so we don’t really know what she believed about the cosmos. I’d like to think she was an original thinker who could work out the math and proofs of a heliocentric system, but…we just don’t know. Michael Deakin has a newer biography Hypatia of Alexandria: Mathematician and Martyr which I haven’t read. Maybe it has some insights into her math studies. Just wondering about the depictions of the Parabolani burning the bodies of fellow Christians. I appreciate that Pagans and Jews would be happily burnt but I am sure I recall a scene where bodies of poor Christians are piled up and burnt outside the city walls? I have to admit I have only vague recollections of that scene where parabolani were hauling and burning bodies and don’t recall whether the dead were Christian, Jewish, pagan or unclaimed dead from the charity hospitals (the parabolani’s roots are as hospital workers transporting the sick and dead.) The Jews generally buried their dead, so if the scene is after the Jewish massacre, the artistic impression would be one of the parabolani desecrating the Jewish dead. Ditto of pagans who believed in some version of the Egyptian afterlife in which their bodies had to remain whole. According to the Catholic Encyclopedia early Christian rites (prayers, sacred ground, etc.) were more closely aligned with local customs than with a overall Church dogma. But the Christian belief in resurrection of the body would indicate that burial was the preferred method. I’ll be getting the DVD soon and will see if I can determine who the dead were. In the meantime, if anyone else has information please post! Thanks a lot for such interesting comments! I adore this movie and this epoch and appreciate your contribution. I just saw Agora last night and was amazed by it. I know it has some inaccuracies, but it was still amazing. Particularly myself as a woman who studies science but also believes in a larger connection with the universe, I find Hypatia a very inspiring heroine. But of course, she had flaws (which definitely DID NOT warrant her death, but oh fundamentalists and politicians… what can I say…). One of the ‘flaws’ that I saw was her considering her menstrual blood as not beautiful. I know in many cultures, menstrual cycle is considered dirty and unworthy of attention. Many women (including my friends) never celebrates menstrual cycle; they curse it as a hindrance to their performance. I am different. I see menstrual cycle as sacred and holy. The menstrual blood flushes out unnecesarry chemicals from women’s bodies, and can also gives life to the baby inside the uterus. In this sense, Hypatia’s menstrual rag contained not only beauty. It has a perfect harmony, circle and balance. It is one of the representations of life. In 2008, I wrote a blog post about menstrual cycle, and although you may not agree with me, may you find it at least interesting to read. Glad you enjoyed it Joel! Thanks so much for visiting and my site (http://www.netflixjunkie.com/) and commenting on Agora. As a guy who studied the classics at St. John’s College, I’m fascinated with ancient history and find your blog to be a delightful resource. Thank you for directing me to it. Thanks, Alex. I really enjoyed your review of Agora! The first use of the name “Catholic” referring to the Christian Church that I’ve found is from St. Ignatius of Antioch, which ironically is the same place the term “Christian” was first used. He wrote a letter to the Smyrnaeans in about 110 A.D. while on his way to be put to death in Rome. So, saying that the Catholic Church was first formed during this time is really not true. This may be where it came out of hiding and began to fight the heresies associated mostly with Arianism and other Gnostic. A little funny history associate with Arius and St. Nicholas. During the Council of Nicaea, Nicholas, Bsp., walked to Arius and slapped him across the face. The other bishops were outraged and sent him to Constantine for punishment. Constantine gave the bishops authority to make the decision to what happened to Nicholas. Olde St. Nick was stripped of his ecclesiastical garments and shackled in prison while the council continued. Repenting of his sin he was eventually reinstated. Love that story when it’s told in a funny way. Oh, yes. There really is a St. Nicholas, in case you didn’t know.. Thanks for the info on St. Nick and the earliest use of “Catholic” in reference to the earlier Christians. I was trying to put the 5C Christians on the evolutionary timeline of the modern Catholic Church in my comment, “In spite of Constantine’s efforts to get some unity through the adoption of the Nicene Creed in 325, the next seven decades see brutal infighting in what was to become the Catholic Church.” I suppose I should have inserted “modern” in there to clarify. And, yeah, some of those early guys were hot-headed and brutal…Amenabar’s point about the corrupting influence of zealotry in any age or in any religion. i SAW THIS MOVIE LAST NIGHT ON CABLE. I had studied about Hypatia years ago. It was so refreshig to see Xians depicted as they really were, and still are, today. Wonderful movie, even though the history was changed a little. They had to have at least a tiny “hollywood ending”, and Davus killing Hypatia to spare the pain of execution was as close as they could get. Bertrand Russell pointed out that when Copernicus proposed the heliocentric model there was nothing in his work which could not have occurred to an ancient Greek. Coming up wtth the idea was only half the task, possibly even less than half. The major part of the challenge was proving it. The helioceentric model had obvious merit in that it simplified calculations but a separate and more important point was the question of whether it was more than a model, whether it was intended to be an accurate description of the arrangement and workings of the Solar System. This was a question which could not have been answered in Hypatia’s time because the instruments available, thought sophisticated, could not yield sufficiently precise results. The astromer Ptolemy had expressed pessimism because there were many outstanding questions which could not answered. Aritarchus is often credited with proposing the heliocentric model. However, instead of developing an argument which concluded that Sun was at the centre of the Solar System he began with with the assmption that it was and then worked out what the consequences would be. While Hypatia could have developed a very powerful argument in favour of the heliocentric model she would not have been able to prove that it was correct. It was only with the invention of the telescope that observations of sufficient precision could be made to provied proof that the Sun was at the centr of the Solar System. Thanks for the information, Bernard! I mentioned Bertrand Russell earlier because he raised an important point: although ancient Greek philosophers came up with various ideas which were subsequently proven to be correct, the science which did so would have been incomprehensible to them. Although Copernicus proposed the heliocentric model it was Galileo’s observations which proved it. Even then there were still loose ends. The heliocentric model was completed by Newton’s Law of Universal Gravitation set out in his Principia Mathematica. However, in order to do this he had to invent a new branch of mathematics which he called fluxions. His rival Leibnitz invented the same type of mathematics independently under the name calculus. Without calculus there can be no accurate description of the workings of heliocentric model. Some scholars believe that ancient mathematicians were at the very door of inventing calculus when progress in mathematical research ground to a halt. If we cannot resit the temptation to indulge in extravagant speculation about what she might have been up to we can call to mind the fact that Hypatia wrote a book called the Canon of Astronomy. Perhaps it was a book on calculus! After all, we know she liked to figure out new ways of carrying out calculations. Hi Faith, I suppose the film has to portray Hypatia’s story in terms of issues people can understand even if this means “bending” the history somewhat. I have reading about Neoplatonism in order to get some understanding of what the world would have looked like from Hypatia’s perspective. I have found it very difficult. I question I keep asking myself is: did educated and intelligent people really believe this? How can this be reconciled with activity that we would think of as scientific? I suspect that this is a problem that perplexed you when you were writing your novel. Can you offer an tips on how to wrestle with this? The amount of hard information we have about Hypatia is very small but it is just enough to arouse our interest. People cannot help speculating about what might fill the gaps. In a sense, this is what the film does. In doing so, it looks at Hypatia’s life in the light of discoveries made later and asks what if she had made them. It’s a nice idea and it makes a good story but it is bad history. It ignores the fact that people can act in the light of what they know and this is a product of what has gone before. The trap lies in the fact that once something has been discovered the various facts which had to be assembled to make the discovery make an obvious package and it seems impossible to see how their connection could have been missed by previous generations of scholars. When Charles Darwin wrote a letter to his friend Thomas Huxley explaining the Theory of Evolution by Natural Selection Huxley’s reaction was “How stupid not to have thought of that!”. Darwin had used facts which were well known to his colleagues but he had to see their connection and put them together in a logical order before the “obvious” conclusion occurred to him. I think a large part of the problem is that we are inclined to project our views back into the past and to view events in the light of what happned afterwards. To get a more sensible understanding of what Hypatia might have been thinking we need to understand the circumstances of the time, the events leading up to them and the attitudes which Hypatia and those around her would have absorbed. I understand that before the second world war a British historian, Benjamin Farrington, devoted a lot of time to research into why the the ancient Greeks did not make important breakthroughs even though they had the technology and knowledge needed. I think one of his essays was called “Science in a Slave Society”. I suspect the title carries a clue to the explanation. I would like a copy please of your book. As i would very much like to be able to read it. Hypatia stands out in my mind’s eye, her story is a archetype as a study of the plight of evolution. The struggle of the religions= STILL GOING ON, the death, violence, abuse towards womens, childrens, anyone that is standing in the way of that struggle. Irony is we call ourselves civilized in this time as we have computers and tv, fashion, choice of foods, cars, planes, all manner of technological brilliance, yet to be honest…from where i am standing the story of Hypatia is STILL GOING ON. I value your blog here, please let me know how to connect about a PDF you mentioned. Thank you for allowing us to comment here. many thanks. Sorry for the delay! Thanks for reading and commenting. 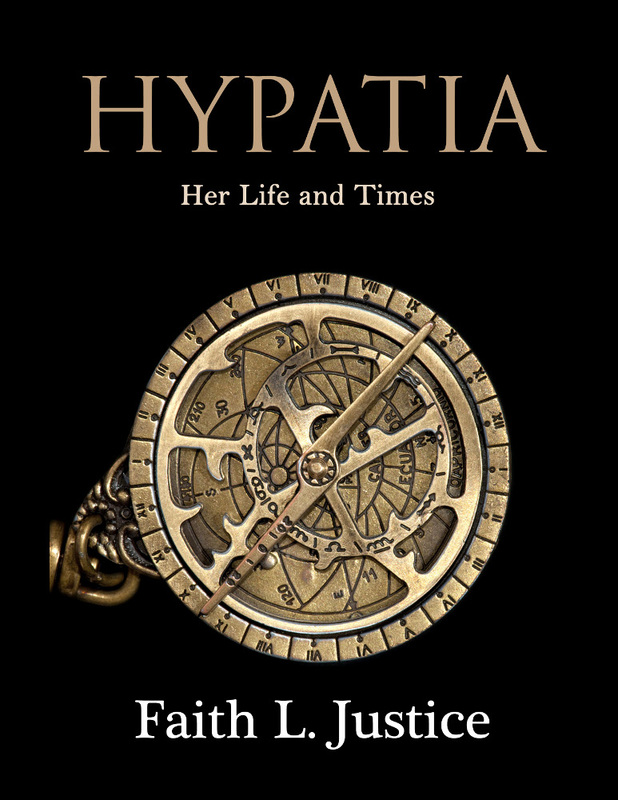 I’ll send the PDF of Hypatia: Her Life and Times today. Hi, I’m studying Hypatia for a series of exams and I’d kinda like to read your book since I’m living and breathing her story at the moment. Would it be possible for you to send me a copy of the book? Thank you so much for the wonderful information that is present on your website. You’re welcome! I’m out of the country, but will be happy to send you a pdf when I’m back. What course are you taking where you’re studying Hypatia? Thanks for reading and commenting. I’m home and will send the Hypatia book out ASAP. If you like it, I hope you take the time to write an honest review and post it to Amazon and/or your other favorite online book stores/reading sites. I found your articles about the movie super interesting, thank you! I have, though, one last question. You say that the fire walking scene is one of your favorite stories from the texts, and that it actually happens between two Christians of different sects. Where could I find this story in particular? Thanks for your comments, Veronica. As to where that story comes from…oh my! I did my research for my novel twenty years ago. My notes are boxed up in the attic. If I had to guess which book I found it in I’d say it’s most likely in Alexandria in Late Antiquity:Topography and Social Conflict by Christopher Haas; but it could also have been in Early Christian Heresies by Joan O’Grady or The Early Christian Church by J. G. Davies. I seem to remember this happened shortly after Cyril took power and starting seizing Novatian Churches, evicting their Bishops, and confiscating their valuables as political payback for them siding with his rival in the elections for Patriarch. Hope that helps! The seven ecumenical councils from 325-787 A.D weren’t just attended by the Church of the West, but more importantly , by the Church of the East as well. There are five ancient patriarchates: Rome, Constantinople, Antioch, Alexandria and Jerusalem, which make up the Pentarchy. Of course, during Saint Cyril’s time, Constantinople and Jerusalem were still archbishoprics (the Pentarchy only coming into existence with the Council of Chalcedon in 451 A.D . in the great Basilica of Saint Euphemia the Martyr in Anatolia, which unfortunately , no longer exists.) Saint Euphemia then became renown as a holy Protectoress of the Council. Modern day Egypt’s majority of minority Christians are now Coptic, an Oriental Orthodox branch of Christianity, and this was owing to a split of opinion on Jesus Christ’s Natures and Wills (the Greek word for nature is physis.) This was the first major split in church history. The other Orientals to split from the Eastern Orthodox church was the Armenian Apostolic Church, (the first nation to have Christianity made their state religion, through the efforts of Saint Gregory the Illuminator in the year 301 A.D , to be precise) the Syriac Church and the Ethiopian Tewahedo Church. In what time exactly, I am not entirely sure, except that it all happened by 578 A.D, aproximately. Eutyches was one of the proponents of Monophystism, meaning belief in in One Nature and Will of the Second Person of the Trinity Whom is God: the Divine. Where as Dyophysites believe in the two natures and two wills of Divine and Human, meaning Christ is the ultimate God Man. This arose from the two schools of thought, Antioch, which stresses Christ’s Human Nature, and Alexandria, which stresses the Divine. The trick was to merge these two schools of theology together to balance it out, and make the church free of heresy. The Monophysites even accused us of being Nestorians, and they suspected the Tome of Leo of having Nestorianizing elements.Eventually, there were rival Dyophysite and Monophysit claimants to the Ancient Seats of Alexandria and Antioch, and then they were and are separate patriarch. This greatly divided the peoples of the Empire , and led to the successful Persian, and then Arab conquests of Egypt, which was detrimental, because of the Romans store of rice grains and the important ports there, and the trade across the nile. Anyway, this movie is set just before that. This movie is set just before the end of the reign of Theodosius the Great, who ruled from 378 A.D to 395 A.D , when the Roman Empire was split between east and west, the eastern part eventually becoming known as Byzantium centuries after the conquest of Constantinople in 1453 to the barbaric Ottoman Turks, after being plagued mainly by attacks from then majority Roman Catholic Western Europe and the Muslim near East for centuries (especially since the inception of Islam in around 610 A.D during Heraclius’ reign, and after the man Mohammed’s death in 632 A.D, during the time of the Monoenergist and Metheletite heresies and Heraclius’ adoption of Greek to the exclusion of Latin from then on for the Empire. ) Theodosius commissioned the impregnable land walls during his reign, as well aquaducts and drainage systems, helping the Byzantines, who were really Eastern Romans, become a great power in the Eastern Medditerranean, North Africa,Southern Spain and the Levant in the Middle East, especially when Justinian regained Western Roman territories, and kept them under the Eastern Empire’s yoke for a time during his successful reign. , and whom many saints studied and applied some of his arguments in a moderate, less heretical and Origenistic form. Indeed, Origen helped systematise Christian theology for the first time. And in 431 A.D, Cyril went against Nestorius, then Patriarch of Constantinople, at the Council of Ephesus, convoked by Theodosius ii. Nestorius said that Mary was the Christokos, the Mother of Christ, and that Christ attached Himself to a righteous man, and Cyril maintained Mary was and is the Theotokos, the Mother of God. Cyril maintained the orthodox and mainstream opinion , and won for God and the church , and Nestorius lost, was deposed and exiled. This was a triumph for Alexandrian theology, and Our holy Mother Mary . This movie is also not accurate in many other points: Hypatia was old by the time she died, so she would not have been a beautiful young woman by that time, since she was born in 365 A.D, being close to 50. Cyril getting a ring for being a succesor bishop is contrary to Eastern Orthodox canon law, as well. And the early Christians never walked across fire or other dangerous elements to display their holiness and power: these were more for times of persecution, to preserve one’s life and/or make the truth manifest, not to test God’s Providence, which is tempting Him, and going against Scriptural authority. The list goes on. This movie is not very accurate or balanced, nor particularly good. No wonder why it failed to gross money! Also, it was filmed by an atheist, and Hypatia is portrayed like a 21’st century woman . This guy dies his homework and I’m grateful for an inform opinion on this movie. i was excited when Agora came out as it’s one of the few movies about this transitional time, a time I’ve been reading about since 1963- when i was 11. Hours that for a geeky obsession? This is my first response EVER to anything posted onLine.